West Side Detroit Polish American Historical Society Holds First Annual West Side Detroit Historic Polish Church Pilgrimage & Święconka on Saturday, April 5, 2008 On Saturday, April 5, the West Side Detroit Polish American Historical Society held its first annual west side historic Polish church pilgrimage and Święconka. The event was graciously hosted by Rev. Anthony C. Richter and the staff of Our Lady Queen of Angels Catholic Church at 4200 Martin Ave., south of Michigan Ave., and was successful in large part due to the support of Rev. Edward F. Zaorski, Vicar of the Southwest Vicariate, and co-Vicar, Rev. Anthony C. Richter. As a result of an invitation by Fr. Tony to hold the opening program and Święconka in Our Lady Queen of Angels’ church hall, as well as media coverage in the Michigan Catholic, Polish Times (Warren, MI), and many other publications including the local Observer newspapers, the Sterling Heights Sentry, and numerous other local publications, the society enjoyed a tremendously successful event. We cannot forget the many local Catholic parishes whose pastors supported us by posting our ad and flyer in their bulletins. Thank you to all of you and God bless you. The program began with WSDPAHS board member and Master of Ceremonies, Mr. Don Samull, giving an overview of the society and of the day’s activities. 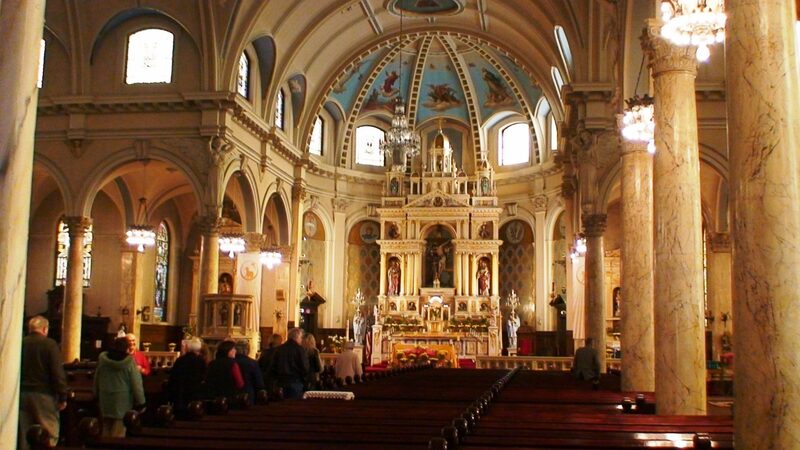 Tour programs were distributed that contained brief histories of each church being visited, as well as brief histories of St. Casimir (organized in 1882 and the first church built by Poles on Detroit’s west side; closed permanently in 1989), and St. John Cantius in Delray, closed permanently in 2007). On the podium were two historic banners awarded to the society by the Archdiocese of Detroit from recently closed St. John Cantius Catholic Church in Delray, which closed in October 2007 after 105 years of faithful service. Ms. Laurie A. Gomulka Palazzolo, Vice President & Executive Director/Secretary, announced that President Adam Lis, who was to be Master of Ceremonies, sent his sincere regrets for his absence. Ms. Gomulka Palazzolo announced that Mr. Lis could not be present due to extreme illness. 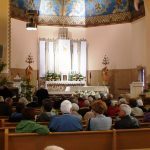 She remembered Mr. Staś Wisniach, the society’s late founding President (1923 – 2007), and made the presentation of a commemorative tribute to historic St. John Cantius to the church’s last pastor of five years, Rev. Edward F. Zaorski and to the former parishioners of the church who were present. The tribute, consisting of framed and matted photographs of the interior and exterior of the church as well as a historical timeline of the church, were prepared by President Adam Lis. 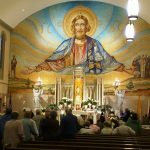 Following the opening ceremonies, 184 pilgrims set out on the tour of five historic churches, beginning with Our Lady Queen of Angels. 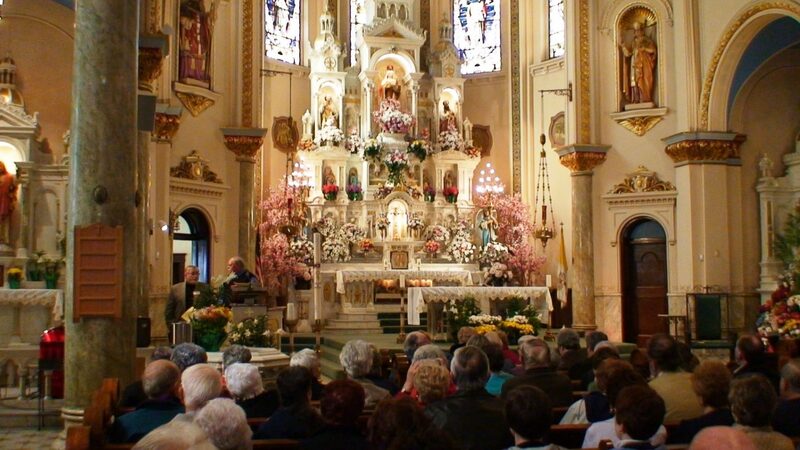 The pilgrims walked next door on the gloriously beautiful spring morning and entered the church, where they were greeted by more relics from St. John Cantius: two angel fonts bearing holy water in the entranceway, and two candelabra on either side of the altar. Mr. J. William Gorski, WSDPAHS board member, presented a history of Our Lady Queen of Angels. Mr. Don Samull led the group in the recitation of a decade of the Glorious Mysteries rosary, and Mr. Steven Frayer, former music director of St. John Cantius and current music director of Ss. Andrew and Benedict and St. Steven – Mary Mother of the World Parishes in Detroit, led the group in singing a traditional Easter hymn. This was the format for the visits to each of the remaining churches. The pilgrims then boarded eight comfortable mini-coaches and set out on the journey toward historic St. Hedwig Catholic Church at 3245 Junction. At St. Hedwig, where Rev. Robert J. Wojciechowski is the current pastor, distinguished WSDPAHS board member Dr. Thaddeus C. Radziłowski gave a presentation on the history of the church. Upon climbing the steep steps leading up to the church and entering its doors, the pilgrims were mesmerized by its breathtaking beauty. 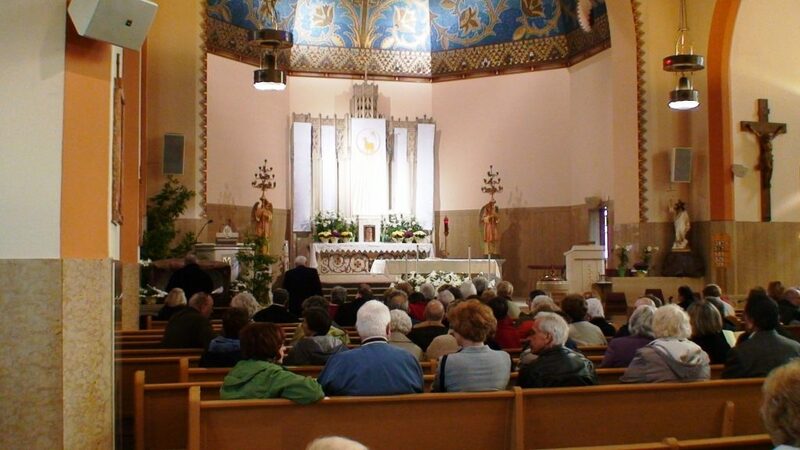 Mr. Don Samull reminded the pilgrims that WSDPAHS President Adam Lis is the historian and archivist at St. Hedwig, that he decorates the church for all its holidays, and that he was responsible for the Easter flowers on all of the overflowing altars, including the high altar. Next on the agenda was St. Francis d’Assisi at 4500 Wesson at Buchanan, where Mr. Tom Rys, church historian, presented the church’s history. St. Francis d’Assisi is clustered with St. Hedwig, and Rev. Robert J. Wojciechowski is also pastor there. The pilgrims then headed to St. Andrew at 7060 McGraw, where Rev. Julian Chmura is the pastor. The pilgrimage leaders informed the group that on the way to St. Andrew they would be passing by the former Baptist church on Martin Ave., just north of Michigan Ave. and just north of the former Ukrainian National Temple, which is now a Hispanic church. During the 1940s through the 1960s, the Ukrainian National Temple at 4655 Martin Ave. was an extremely popular dance hall in the Polish community, and virtually every weekend Polish weddings and dances were held there. As Mr. Don Samull pointed out, the west side Polish Baptists originally worshipped at a location on 25th Street. Later, they relocated to the current site on Martin Ave., which was designed by Lane, Davenport & Peterson. It currently serves a Hispanic congregation. A sad note and one that is perhaps reflective of this entire area of the City is that the building once had a tall white steeple that gave it a New England church appearance, and which was reflective of its Baptist heritage. It is uncertain as to why the steeple had to be removed, but it is agreed that its removal has strongly detracted from the beauty and overall appearance of the church structure. At St. Andrew, Mr. Don Samull gave an introduction and informed the group of many interesting characteristics of the church’s architecture, which otherwise would have gone unnoticed, such as the architect’s incorporation of “X’s” throughout. St. Andrew is always depicted bearing a cross in the shape of an “X,” and he was crucified on this shape of cross at his request as he felt unworthy to be crucified on a cross such as the one on which Christ was crucified. Mr. Samull pointed out that this unique “X” feature is present in the architecture of St. Andrew Church, even on the interior door handles. Mr. Samull also gave some insights into the history of St. Andrew and the reverence Poles and other East Central Europeans have for this saint, as it is believed that he was responsible for bringing the faith to those countries. 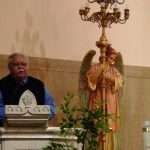 Dr. Thaddeus C. Radziłowski, who is an extremely popular lecturer and historian and whose presentation at St. Hedwig was very well received, gave a most interesting and intriguing history of the parish. In his unique way, as he did at St. Hedwig, he situated the parish historically, asking the pilgrims to take a look at the map in their tour guides and giving those present the foundation of the immigrants’ influx during the early part of the twentieth century. He explained why so many Poles came to America and traced their paths, which coincidentally were the paths of many of the parents, grandparents, and great-grandparents of those present on the pilgrimage: from Poland-in many instances, the Galicia Region in southeastern Poland-to the coal mining communities of Pennsylvania, to the “better” jobs of the automobile plants and their numerous consequential industries in Detroit, including the paint, glass, steel, and rubber industries, as well as a multitude of automotive component industries that once made this one of America’s great industrial cities. Dr. Radziłowski added that when he was in high school in Hamtramck, St. Andrew was a rival basketball team, and many in the tour group recalled that St. Andrew was noted for its superior, award-winning basketball team. After leaving St. Andrew, the pilgrimage headed for St. Cunegunda at 5866 St. Lawrence St., where Rev. Zygmund Grankowski is the current pastor. Prior to arriving at St. Andrew, the pilgrimage group passed by the historic former Our Savior Polish National Catholic Church at 5272 Chopin St., founded in 1911. As Mr. Don Samull pointed out, this was the first and mother church of all Detroit’s P.N.C.C.’s. The P.N.C.C. 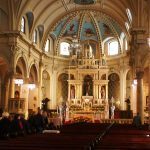 is a Christian church founded by Polish Americans who were Roman Catholic but who differed with the Church’s theology and administrative policies. Our Savior P.N.C.C. inhabited the building on Chopin until approximately 1970, when they relocated to their current location at 610 North Beech Daly Road, Dearborn Heights. Afterwards, a group of Romanian Pentecostals inhabited the structure on Chopin for many years. It is currently inhabited by an African-American congregation. Two other P.N.C.C.’s in the Detroit area are Holy Cross P.N.C.C. in Hamtramck (founded in approximately 1916) and All Saints P.N.C.C. in Sterling Heights. 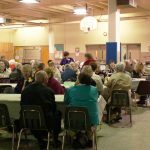 On Saturday, May 17, the WSDPAHS will hold its second annual joint membership meeting with the Polish Genealogical Society of Michigan in Dearborn Hts. (see advertisement elsewhere on this Web site). The presentation will be on the history of the Polish National Catholic Church. We were greeted by Sr. Alexis of St. Cunegunda and our presenter, Rev. Gary Michalik, WSDPAHS board member and current pastor of St. Theodore of Canterbury Parish in Westland. It was truly amazing to see the number of pilgrims who rushed to embrace Fr. Gary and to realize how many remembered him from past parish ministries or from old neighborhoods. He was a crowd pleaser to say the least. Fr. 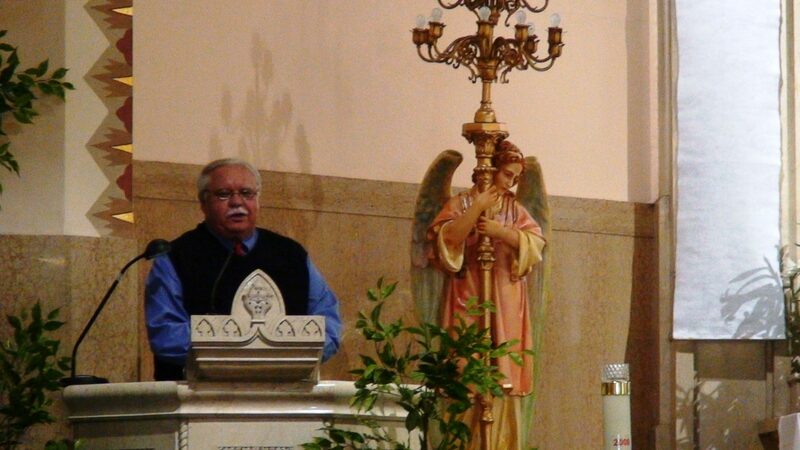 Gary gave an extremely thorough and vivid history of St. Cunegunda, commenting in minute detail about the various architectural and structural details that were added throughout the years, remarking at one point that he remembered going to confession there as a child, although he and his family were members of St. Andrew. A unique part of the St. Cunegunda experience was that WSDPAHS member Mr. Chet Szerlag and his wife Judy, who came to the pilgrimage all the way from Woodridge, Illinois (a suburb of Chicago), was a student at St. Cunegunda in the 1950s. WSDPAHS members can look forward to his story on St. Cunegunda in the forthcoming late April edition of the e-Newsletter, and we will be posting his historical scanned postcard images of St. Cunegunda on our Web site in the near future. Upon returning to Our Lady Queen of Angels for our Święconka, at which 206 individuals partook, the group was greeted by our distinguished guest, Most Rev. Francis R. Reiss, who performed the traditional blessing of the Easter eggs and other food. Bishop Reiss is formerly from St. Andrew Parish. 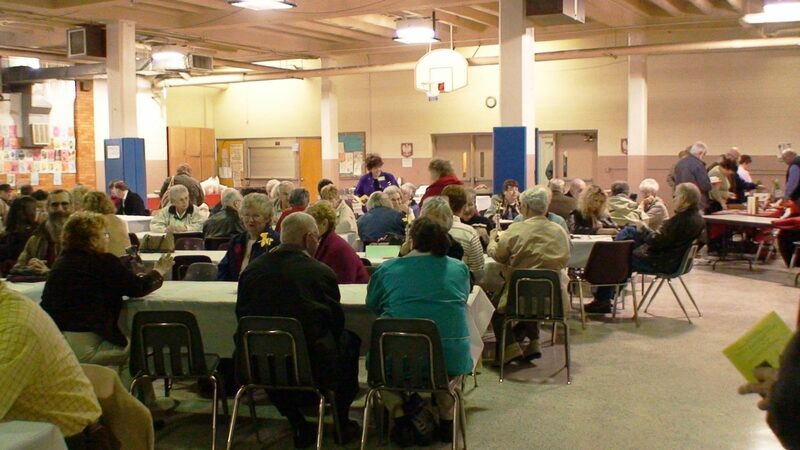 The guests shared the blessed eggs (jajko poswiecony) and then partook of the wonderful meal prepared by Ms. Diane Grunas and her staff at Our Lady Queen of Angels: Ms. Eileen Antal, Ms. Angie Barket, Ms. Sue Kotyk, Ms. Helen Micklash, Ms. Vickie Rangle, Ms. Gene Zmuda, and Ms. Mary Anne Zylla. The delicious meal consisted of kiełbasa, ham (szynka), potato salad (sałatka kartoflana), deviled eggs (jajka na twardo), beet horseradish (ćwikła), bread (chleb), butter lambs (baranek z masla), and a variety of cakes, or babkas, plus coffee (kawa) and fruit punch. As a special feature, traditional Polish and English Easter hymns were provided during the meal by WSDPAHS member, keyboardist/vocalist Steven Frayer. Immediately after the meal, Ms. Irene Pilch, former parishioner of St. John Cantius Catholic Church and volunteer secretary of the parish for 40 years, was presented with a certificate of recognition by the WSDPAHS for her years of community service and for the role she played in assisting the society in communicating with the Archdiocese of Detroit to acquire the artifacts from the church when it closed. As a special presentation, during dessert WSDPAHS member Mary LaDrigue demonstrated her traditional butter lamb making art as done in the Polish villages. Mary was featured in the March 14, 2008, edition of the Michigan Catholic. She explained that she learned her technique in the 1940s from her mother, who was from the St. Hedwig parish. Her mother’s parents owned a grocery store near the church, and the lambs were one of the most popular items. She does not use a mold, and a separate stick of butter is squeezed through a piece of cheesecloth to make the lamb’s “fur.” A red ribbon around the lamb’s neck symbolizes the blood of Christ. Raffle tickets (50/50 and general) were sold by WSDPAHS board members Dr. Alina Klin and Mr. Richard Sokolowski, with gorgeous items on the raffle table donated by Mr. Don Samull, including many beautiful items from Poland. The bonus item was a beautiful, hand-made, mounted Polish eagle donated by artisan Bob Baranski of Dearborn, which will be raffled off at our joint meeting with PGSM on Saturday, May 17. A special incentive was offered for those attendees joining the society that day, and as a result, over a dozen new Membership Applications were received. 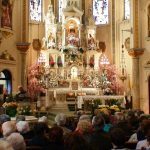 Among the churches being considered for future pilgrimages are St. Casimir, St. Hedwig (repeat), Former Our Savior P.N.C.C., St. Stephen, St. Barbara, Ss. Peter & Paul, New Our Savior P.N.C.C. (Dearborn Hts. 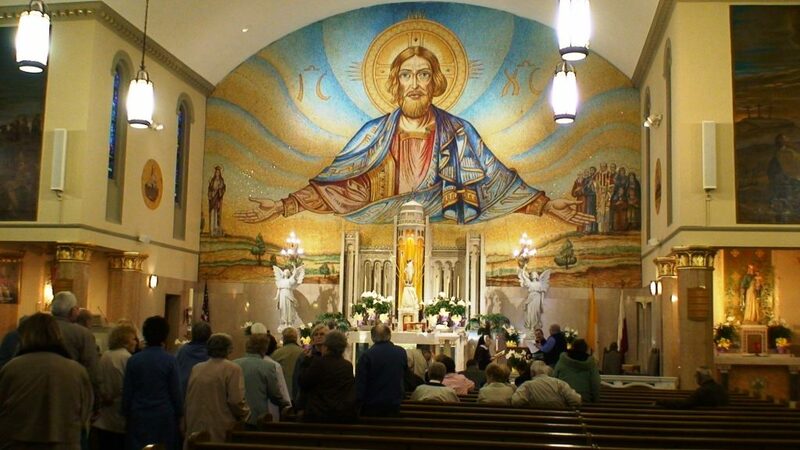 ), Felician Sisters Motherhouse Chapel (Livonia), Our Lady of Mt. Carmel (Wyandotte), St. Helena (Wyandotte), St. Stanislaus Kostka (Wyandotte), Mariaviate Catholic Chapel, St. Stephen (New Boston, founded 1874), and St. Hedwig Cemetery Chapel (Dearborn Hts. ).